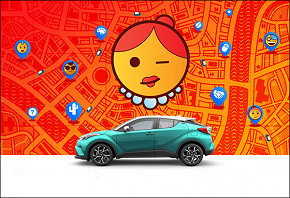 Outsell announced today that in partnership with DSPlus, the 2018 TOYOTA C-HR LAUNCH CAMPAIGN is a finalist in the Most Original Email Campaign category. The ride with many sides. The all-new 2018 Toyota C-HR was poised to launch in a formidably competitive market where brand disloyalty was rife, with entry-level SUVS gnawing at the style space. 55% of the competition touted All-Wheel Drive, which the C-HR lacked. What it did deliver was a sleek silhouette with precision-cut lines, a cushy ride and agile handling—as well as edgy standouts such as hidden rear-door handles, available puddle lights and segment-leading standard safety. Drum up excitement and capture a considerable chunk of the entry-SUV market. Emphasize the C-HR’s sharp styling, crisp handling and standard safety. Offset the SUV’s lack of All-Wheel Drive with segment-leading standard safety firsts. A cross-tier strategy was developed to offer marketing support for multiple TDAs and hundreds of dealers across the country. Our target perceived themselves a stylish band of doers, ringleaders and trendsetters—much like this expressive SUV. So the creative strategy reached out to them in the evocative and universal language of Emojis—communicating versatility across varied contexts and cultures. Particularly relevant was the fact that Emojis taking center stage in pop culture as the future form of expression. An engaging lead piece heralded the multifaceted ride, featuring an iconic medley of quirky characters that mirrored our multifaceted target. Every other layer of communication took the cue—and said it all with this unique emotional discriminator. SEE MORE with this walkthrough of the campaign. The Digiday Content Marketing Awards recognize the content that connects brands to audiences across channels including mobile, social, video and more. Over the years, the awards have honored leading work from companies like Casper, CNN, and Dove. This year’s winners will be announced and finalists honored at the awards gala on May 9 at Sony Hall, located in NYC.